Saturday May 7th 1921 I gave my part of the house a good cleaning up and put all Wills things out to air. I was ready to go to town when The Girls went to a church meeting before three oclock. I went up to sit by Wills grave awhile. This is his birthday. Bless his dear loving heart. If I only had him here with me now. I waited in the car by the store to come home with the folks. Hattie & Cora rode in evening. I was too tired. Sunday May 8th 1921 It was a nice day. Hattie had the Byingtons and Mary Moss here for dinner. It was late when it was done. As soon as Hattie & I had the dishes done she went with Ott & Fannie to the funeral of Miss Elizabeth Sweeney. I looked over the papers and got out an old diary of 1913 and read in it a long time. After supper we walked over to see Mrs Broadway. R & C at the store. Ott to Chicago tonight. Monday May 9th 1921 Cora cleaned garret in forenoon and I helped some. Hattie to Old Ladies Home to lunch and later to Shakespeare Club. Cora and I were resting about three oclock when Rob called and we got ready to go to Cedar Rapids. Stopped for Hattie and Mrs Sheldrick. We started right back it looked so stormy. We were caught in an awful rain. Got to Mrs Sheldricks at 8 oclock and had supper before coming home. 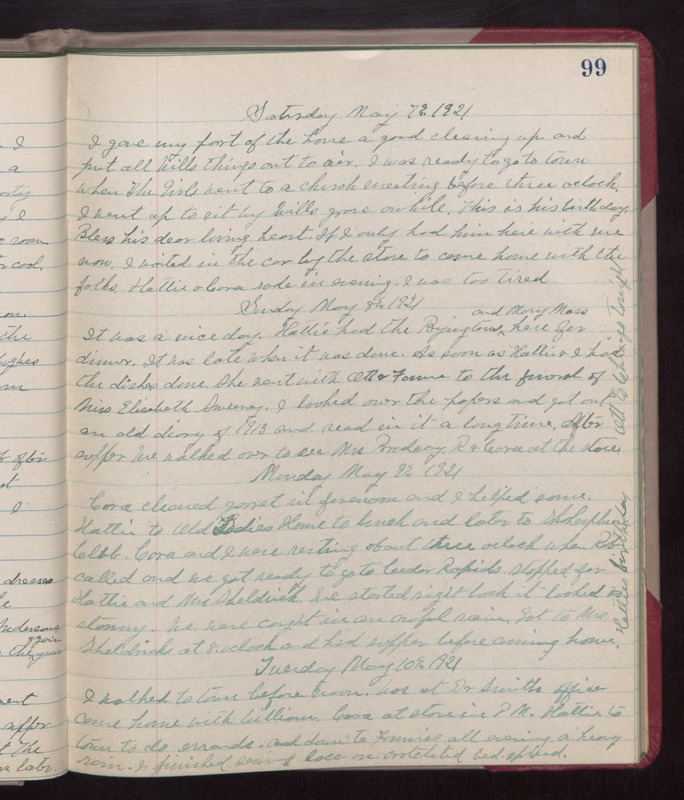 Tuesday May 10th 1921 I walked to town before noon. Was at Dr Smiths office. Came home with William. Cora at store in PM. Hattie to town to do errands and down to fannies all evening. A heavy rain. I finished sewing lace on crotcheted bed-spread.